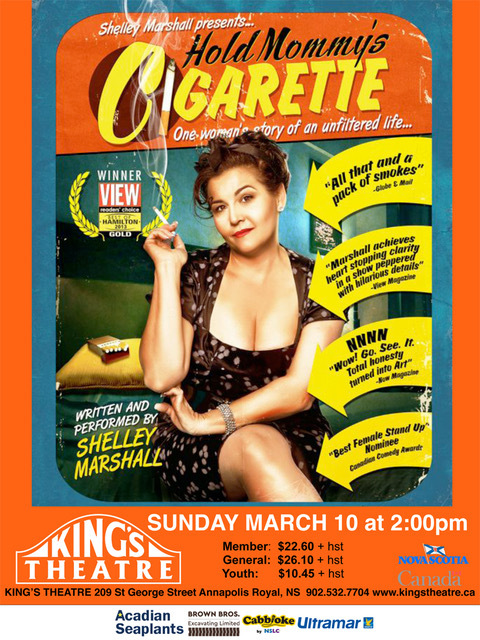 On Sunday March 10, King’s Theatre will be presenting the Nova Scotia debut of the smash hit one-woman play, Hold Mommy’s Cigarette, by award-winning actor, playwright and comedian Shelley Marshall. It took Marshall, who moved to Bear River last year from Toronto,10 years to create the piece, which explores her life’s ups and downs through a mix of stand-up, improv and theatre. The variations amplify the complex emotions in a way that resonates with the audience and pulls them deeper into the story. For five years, Hold Mommy’s Cigarette was sold-out in theatres in Toronto and surrounding cities, receiving Gold in the category of “Best Theatre Production” in 2013, “Best New Discovery” by Now Magazine, and saw Marshall nominated “Best Female Stand Up” in Canada by theCanadian Comedy Awards. Marshall also served as host of the popular televised Hamilton Music Awards for four years. Marshall’s show has made a significant contribution to raising mental health awareness. “I knew creating works of art that expressed my experience, my truth, and my understanding would bring a joyful purpose to my life”, she said. “I feel I not only have an opportunity, but obligations, to convey a message that can help people heal.” Blazing uncharted trails, this comedic whirlwind production leaves audiences breathless. Tickets are available by contacting the King’s Theatre Box Office at (532-7704) or online at kingstheatre.ca.